If you’re one of the lucky ones currently looking forward to a family ski holiday during the Christmas break or early in the new year, then we envy you – because you’re bound to have a great time. There’s something about snow that brings out the child in all of us, so to have a ski holiday with your own children planned really is something to look forward to. The Christmas holidays, the February mid-term break, and the Easter holidays (particularly if Easter falls early in the year) are the most popular times for a family sky holiday – but they are also the most expensive, so it is essential to book well ahead. If your children are of pre-school age, then consider travelling outside of these times. Also consider how March and early April are warmer (but still with plenty of snow on the ground!) and there’s more daylight too, so they are more child-friendly. Self-catering accommodation is a great choice for families with younger children. If you have teenagers, consider a Club Hotel instead, which generally have lots of activities laid on for people of that age. If travelling with a tour operator to a main resort, most offer childcare options such as private nannies and English-speaking crèches. However, make sure you book well ahead, as demand is high. If organising your own trip, your accommodation provider will also generally have a list of local childcare providers, but again make sure you organise this well in advance. Buying new ski cloths and ski gear for everybody is expensive. Borrow what you can, and also look out for the regular ski sales in discount stores like Lidl and Aldi. Their equipment and clothing is of sufficient quality to get you through at least a few holidays! For helmets though, consider waiting until you get to your resort, and then renting instead – particularly for children. The resort will have a huge range of helmets in stock, as well as the expertise to properly fit one to provide maximum protection in the event of falls. Your children will be eager to learn how to ski and maybe even snowboard too, so make sure before you go that children’s lessons are offered in English. Also remember that ski school for children only lasts part of the day, and that your own lessons may go on for longer – so think about who’s going to mind the children then! It might sound like a no-brainer, but keep a close eye on your children in the snow. They won’t be used to it, and while it’s great fun a great deal of the time, they may actually tire of it eventually each day too. Don’t force them to stay out longer than they want to. Also be aware of weather challenges such as exposure to cold (for even a short period, for instance if changing a coat), and even ‘snowburn’ – caused by light reflected off the snow. Make sure they have sunglasses or other protection. And remember your travel insurance! Again, remember that taking out family ski holiday travel insurance with Insuremyholiday.ie gives you complete cover for your holiday in the snow. 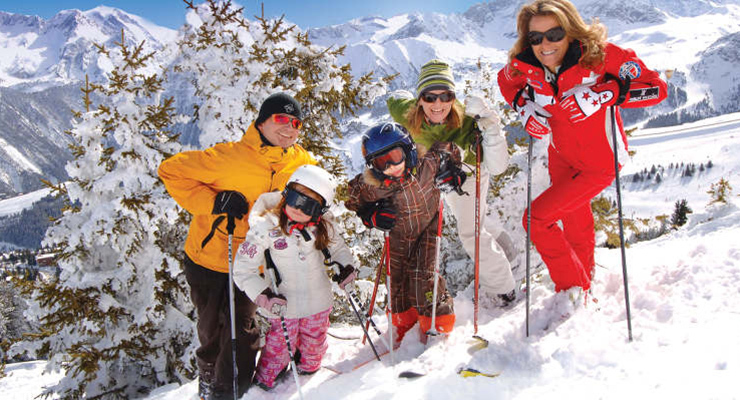 A policy from us gives you the peace of mind you’ll need to enjoy your ski holiday to the max. * Children are defined as dependents up to the age of 18 years.